Throughout the world there are ports that assume a special place in the atlas of the imagination: the waterscape of Sydney; the concrete and glass backdrop of New York; the neon-clad, frenetic mêlée that is Hong Kong. All could be said to be romantic, especially when viewed from the promenade deck of a cruise ship as she slips her moorings, but there’s one port city that is an allegory for love: Venice. Known the world over as La Serenissima – the most serene, Venice is transcendentally beautiful; around every corner, the eye is massaged by vistas of sublime beauty. This is a Dorian Gray city, a destination for lovers, and as seductive a port as any on the seven seas. Ideally fused with its watery element, Venice slips over the blue horizon as a great statement of human ingenuity and fancy. The implausible setting interspersed with campanile and domes, colonnades and pinnacles is not so much faked as well edited, costumed, and choreographed. 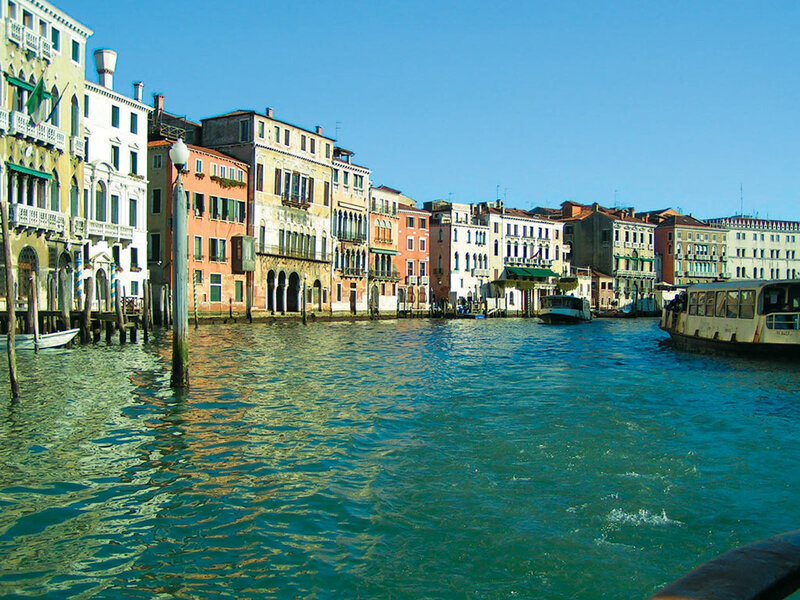 Cruise passengers eagerly anticipate any arrival or departure from La Serenissima as their mighty ship slowly navigates the Canale della Guidecca and Canale di San Marco – Venice’s main waterways to the open sea. The ship’s whistle clears flotillas of vaporetti and ferries criss-crossing the busy waterway as passengers look down on the magnificent Palladian façade of San Giorgio Maggiore, the incomparable Basilica di Santa Maria della Salute, and the imposing Venetian Gothic Palazzo Ducale. This ‘Venice-at-your-feet’ perspective might be the prerogative of fortunate cruise passengers, but from the vantage-point of cafés that line the waterfront along the Dorsoduro, they are not only incongruous, the wash created by their passage is considerable. And it is the perceived damage these leviathans are causing the city’s fragile lagoon that has stoked environmentalist’s protests over the last few years. In November a ban was announced by the Italian Government that would reduce by 20% the number of cruise ships over 40,000-tonnes that could sail this route to the Stazione Marittima cruise terminal from January. It also imposed a complete ban on all ships over 96,000-tonnes from 2015. In typical Italian style a regional court in Veneto has suspended the statute, ruling that the risks posed by cruise ships have not been proven, and an alternative route to the city’s cruise terminal has not been agreed. Currently the decree will be re-examined in June, but it looks likely that the largest cruise ships may not be able to offer this unrivalled navigation much longer. “STREETS FULL OF WATER – PLEASE ADVISE”. So ran the telegram sent back to New York by the American humorist Robert Benchley when he arrived in Venice for the first time. Of course he had a point; the fact that Venice uses water in much the same way that other cities use asphalt is just one inimitable characteristic of this city that exceeds every expectation. Offering a unique contribution to civilised city life, Venice has influenced Western civilisation more than any other city in terms of painting, architecture, music, and sculpture. Impressive qualities undoubtedly; but not so remarkable when you consider that it was the longest-lived republic the world has ever known. For almost a thousand years this city at the northern tip of the Adriatic was the acknowledged mistress of the Mediterranean – the richest, most powerful and by far the most opulent state Europe has ever seen. Never once throughout the city’s colourful history was it invaded, sacked or destroyed. The 2½ miles of shallow lagoon that separate this timeless, sophisticated city from the mainland not only acted as protection from civil wars, it was instrumental in the establishment of a monumental trading empire – the envy of the civilised world. At the aorta of the city, the Piazza San Marco is a dazzling mosaic of European and Byzantine architecture whose cynosure is the Basilica San Marco with its massive bronze doors, crowned by the ‘Last Judgement’ mosaic. Turning off the main tourist routes, marked by omnipresent yellow direction signs, the real discovery begins. Leave the map behind and explore one of the labyrinthine sistieri (the six neighbourhoods that make up Venice). Amble along narrow calle (alleyways), cross centuries-old bridges with dark canals silently running beneath them, peer into dimly-lit artisans’ workshops, stumble upon empty squares or courtyards that were perhaps once occupied by Marco Polo, Vivaldi or Byron. No matter where you meander the Rialto Bridge never seems far away. Built in 1592, the two rows of shops give this much-photographed bridge its distinctive appearance. The broad inverted S-shaped waterway that is the Grand Canal divides the city in two halves. Fronting either side are the façades of timeless palazzi such as the Ca’ d’Oro, Palazzo Grassi and Palazzo Dario, little changed since Canaletto and Tiepolo used their brushstrokes to such evocative effect. On the east bank of the Grand Canal, in the idiosyncratic Dorsoduro, you come across tall houses waging a war of attrition with the rising damp. Geraniums and begonias trail from window boxes of these ochre and terracotta brick buildings. The soporific air hangs heavily as the city’s denizens amble past as if detached from the ebb and flow of time. In any other city such areas would be accused of falling into an elegiac desuetude, but here such dilapidation is more like a stage set. This is the Venice which exerts a perpetual hold on the imagination; the Venice whose haunting melancholy, seen through the eyes of Thomas Mann in his novella ‘Death in Venice’, and so masterfully immortalised on celluloid by Visconti. Here it is possible to find one of the most awe-inspiring interiors of any church in Venice. The 16th century Chiesa di San Sebastiano was not only decorated by Veronese, he was buried here in 1588. The large square of Campo Santa Margherita with its busy market is an ideal place to live like a Venetian. Leave the ‘tourist menus’ behind and step inside a bacaro, one of the traditional Venetian bars dating back to the Middle Ages, and order an ombra – a glass of local wine such as Verduzzo or Prosecco – to accompany the delicious cicchetti of grilled prawns, or savour polenta topped with salami and wild mushroom. Venetians have shopping down to a fine art and visitors can pick up a quality souvenir or some reasonably priced designer clothes. Beware the tourist traps around the Rialto and San Marco where vendors will try and persuade you to become the proud owner of a fine Cartier Panthère that tells the time, but isn’t; suggest you to protect your eyes from the sun in a pair of Ray Bans that are stylish, but simulated; or convince you to pack your cruise wear in Louis Vuitton luggage that’s natty, but knock-off. As the late afternoon sun casts haunting shadows across the dappled water of the Grand Canal the ultimate romantic treat awaits. Embark on the most costly yet romantic mode of transport in the world. With its elegant black asymmetrical shape and proud stern iron, the gondola is not just the symbol of Venice; it is a quixotic conveyance for turtle doves. Disembark along the Riva degli Schiavoni and walk past the Palazzo Ducale and the Bridge of Sighs to Piazza San Marco just as the sun burnishes the sea and the evening Angelus fills the air. The Two Moors ring the great bell atop the 9th century Campanile San Marco arousing the pigeons to circle the Piazza in one last sweep before settling down in crevices of the arcade. From the opposite side of the Guidecca, beyond the baroque cupola of Santa Maria Della Salute, the bells of San Giorgio Maggiore respond; these are older bells, their chiming muffled by the water journey, giving their chorus a splendid subtlety. The end of the day beckons in this serendipitous set-piece of marble façades and carved stucco that for so long the sea has tried to reclaim. Little wonder Charles Dickens said of Venice: “I never saw the thing before that I should not be so afraid to describe.” This celebrated novelist never had the opportunity for an aerial perspective on this powerhouse of the Renaissance, now time might be running out for romantic cruisers. Seldom in the wonderful world of cruising is reality so entertainingly edited; rarely do you witness an occasion that demands to be shared with the one you love.